I have reached the end point with the nut for octave adjustment but the tone is still too high. How this can be solved, would new strings help? I'm assuming you mean that the intonation is still 'sharp' on the strings where the bridge saddles are adjusted all the way back(?). What's the make and model of the guitar? Can you take a closer picture of the saddle that you're talking about please? From that picture I'm guessing that you're talking about your 'G' string? yes you are right, it is the G string. Also the E string is on the end but this one has the correct pitch. I will change the strings and will see. my advice is to take it to a licensed luthier, ask him to adjust your intonation, and ask him to let you watch. adjusting the saddles can be tricky without enough experience. 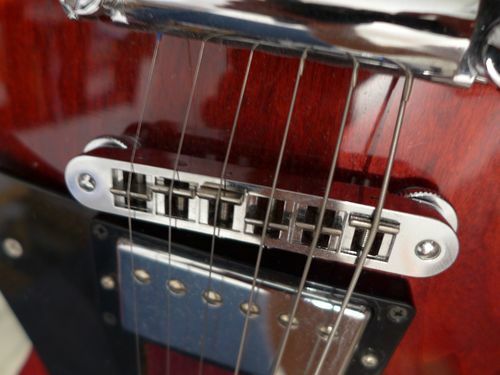 by watching him do it, you'll have a better understanding of the component parts of your guitar. good luck to you. Hi Petr, I'd definitely recommend changing the strings first and make sure they are well stretched in! Whilst you have the strings off screw the saddle back to the other side of the Bridge and use that as your starting point. When adjusting the intonation on these types of bridges a small 1/4 - 1/2 a turn can make a big difference as you have a shorter scale neck. 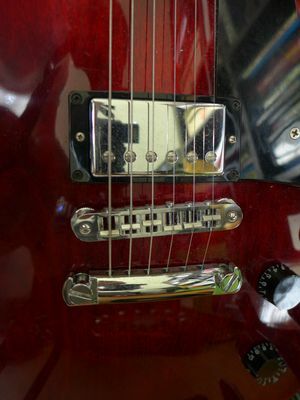 Keep checking with a Tuner, your open string, then fretted at the 12th fret and then the 12th fret Harmonic, all three should ring a true G. If you're not too confident of doing it then I'd suggest taking it to your local repair guy/Tech. If you take your time and move the saddle by small increments each time you should be fine!